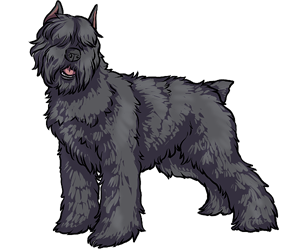 A Franco-Belgian breed, Bouvier des Flandres was originally bred in Belgium as a working dog. Farmers and butchers used the dogs daily for cow herding and cart towing. Monks at the Ter Duinen Monastery were the earliest known breeders of the breed and were bred from wolfhounds and deerhounds. World War 1 almost wiped the breed out; they were used as military dogs. In 1936, a standard was written by the French-Belgian committee but the breed was again threatened by War World 2. This caused setbacks, but in 1965 the breed standard was completed and adopted. Prefers to be apart of a flock or pack, even if the pack consists of humans. Was bred for its temperament, strength and coat because it could withstand heavy weather conditions. The "founder" of the breed was a perennial winner of dog shows who also served in the war. His name was Nic.